I played in the local Solihull and Shirley Senior Silver Nov 2018 over the 24 and 25th. On the Saturday, I played singles and doubles with Lydia Ip. In the singles, I played Lowri Hart from Wales and struggled to find my rhythm in the match, and lost 21-18 and 21-12. 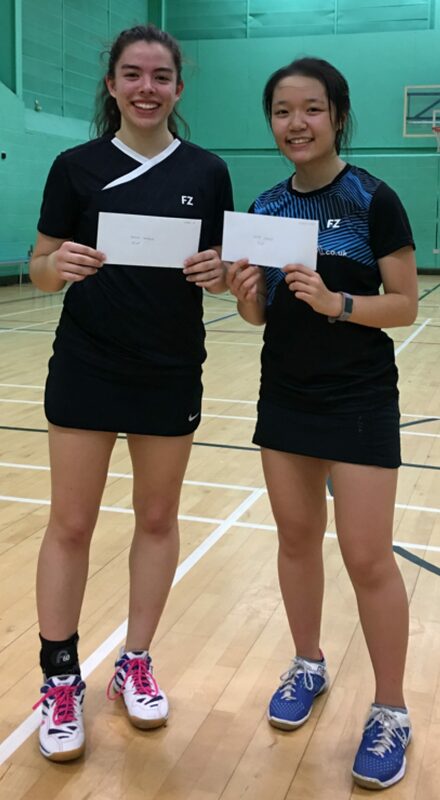 Later on in the day, myself and Lydia played a pair from Lincolnshire and won comfortably 10 and 8. Due to the small number of entries in the ladies doubles, this booked us a place in the semi final. We played Chloe Hunt and Abbie Smith from Warwickshire and Hertfordshire respectively. We won the first set comfortably to 13 and in the second went 18-17 down and then eventually came through to win 21-18, which meant we had a place in the final! For the final match of the day, we played a pair that are studying in the UK but have come over from Hong Kong. They were a very experienced pair and therefore took the first 21-13, but we managed to take the second 21-18. After some extremely long rallies, we eventually lost 21-15. Lydia and I had never played together before this tournament so we were both very pleased with the result. On Sunday I competed in the mixed doubles with Jack Taylor. We managed to reach the last 16 after beating a pair in the year group above us in the 1st round. I thoroughly enjoyed competing at such a high standard at a senior tournament and there a lots of areas for improvement for me!